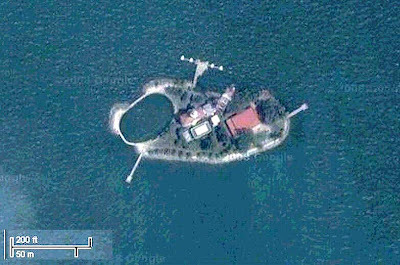 Sultan Shoal Lighthouse used to occupy a strategic location guiding ships from/to the Straits of Malacca into the Western Achorage. While the island that the lighthouse is sitting has not moved, it is now much closer to the mainland! This is due to the major reclamation works that occurs in Tuas South as well as the creation of the Jurong Island (Jurong Island is linked to the main land by a bridge). 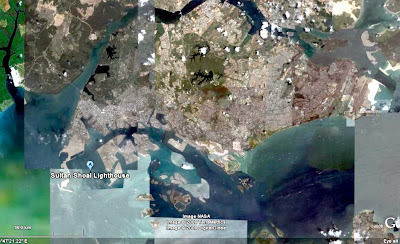 From Google Map below, we can see with the extension of Tuas South, it looks like the Lighthouse is now in a "bay"! To the North is Jurong Island and to the West is Tuas South. The Lighthouse was built on a small outcrop, and to prevent erosion to the shoreline, the island has been ringed with big granite boulders. 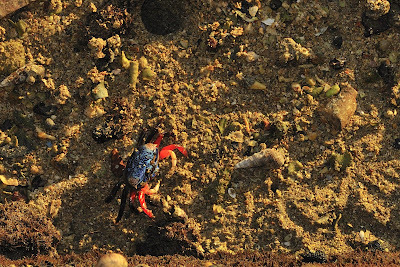 Thus this island has no mangrove plants, as well as the lack of a sandy shore. However the granite boulders provide good grazing ground and provide good “hold fast” to the grazing shell-animals, especially the Neritae. 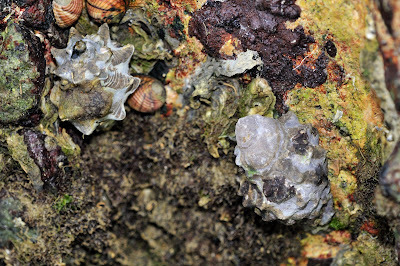 This molluscs come in many colours and sizes, and basically occupies every granite rocks that it was impossible stepping on them as we moved around to explore the organisms that thrive in this area. 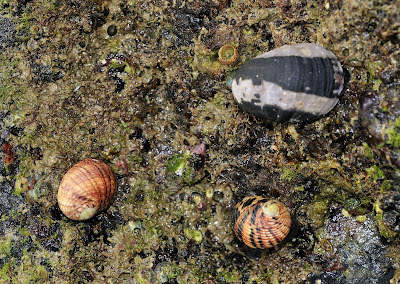 On one spot, I foound these 3 Nerites but of different species The whitish spot is actually Nerite's egg capsule. 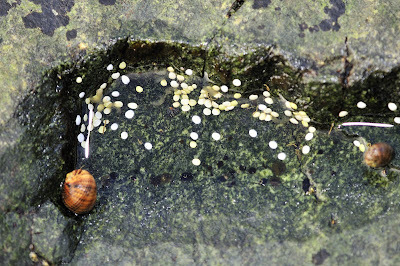 Each of these contains about 30 eggs. 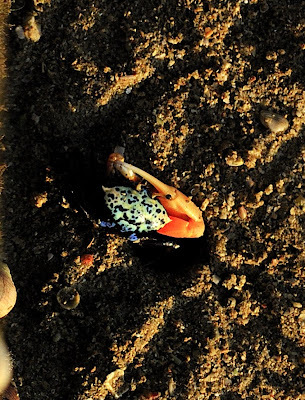 Now we know why the whole island is carpeted with Nerites. 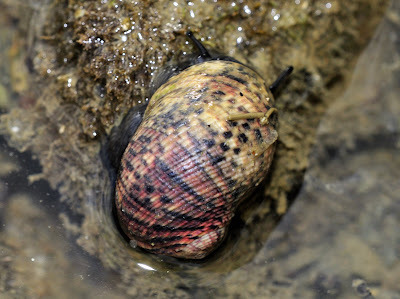 Other molluscs that were seen here are the Rock Snail (Family Muricidae) which cling tightly to the wall, Cowrie with length span of about 6 cm. 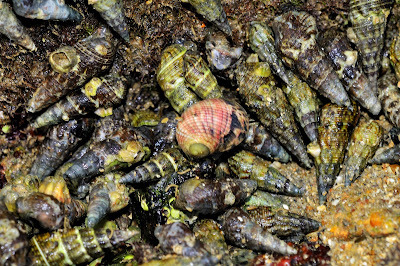 Such beautiful animals will never have the opportunity to grow to this size on the mainland, as it will be collected for its beautiful shells. 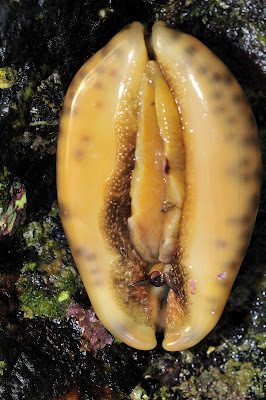 Cowrie (Cypraea arabica). 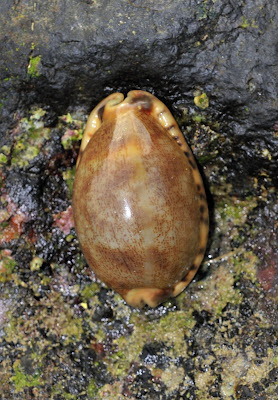 The pattern on the shell looks like Arabic writing, and thus this cowrie is called as such. 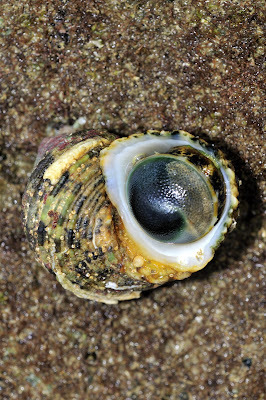 Found in abundance is the Turban Snail, the Turban Snail (Turbo sp) is also a grazer of algae, and its notable characteristics is the “trapdoor”, in some country the operculum is collected and make into buttons. 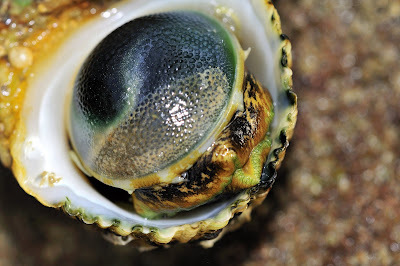 One do not have to wonder why, just look at the beautiful pattern and colour. 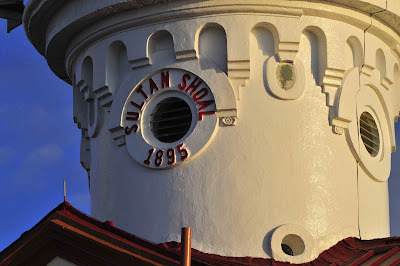 The other interesting feature of Sultan Shoal Lighthouse, is a man-made sea water pool, that provides the artificial inter-tidal area that was lacking on this island. In this pool, most of the animals were trapped as the tide receded. Those not considered traps, find this a good refuge, with soft sandy mud, and detritus left by the tide. On this field trip, we have Prof Ng to guide us on crabs. 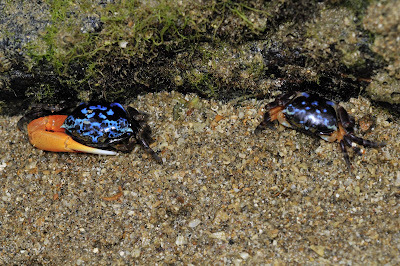 In this pool, we were able to see many Fiddler Crabs, and Prof Ng pointed out the endangered and beautiful Fiddler Crab (Uca tetragonon). 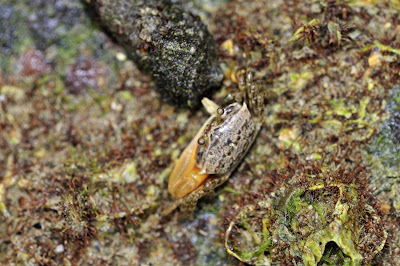 Usually in the Fiddler (Family Uca), the male is the one that is brightly colour, and the female adorns a duller shade. 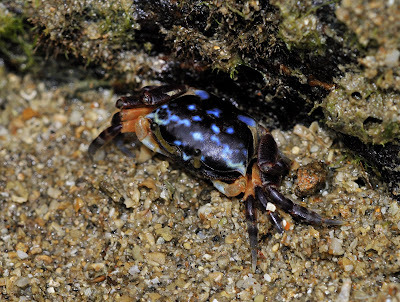 But not for this species, both the male and female were equally colourful, except that the male has a longer reddish pincer to attract the female as well as to ward off potential male. Uca tetragonon is extremely shy creature, and is very skittish, it will escape to its hole with the slightest disturbance in the form of light, vibration. Thus this fiddler seldom strays very far from its nesting holes. Due to its skittishness, Uca tetragonon tends to build their nesting holes near to a wall or rocky outcrop. This also work to our advantage, as to take records of this crab in their undisturbed condition, means one can observe them from above. It is extremely difficult to photo them at ground level, so I climbed onto the pool walls and adopt a prone position from the top (about 4 m up). 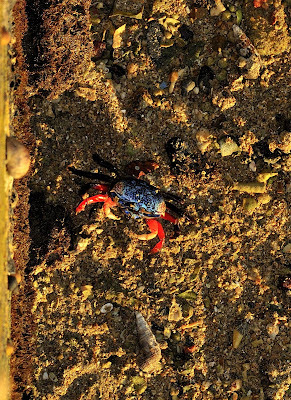 Fortunately I was using my longer macro lens (Tamron 180 mm – equivalent to 270 mm on the 35 mm scale), even with this focal length, it was not possible to fill the frame with the crabs. 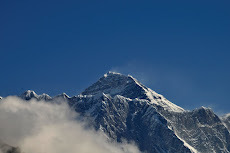 A lot of post cropping need to be done, for the images to be blogged! 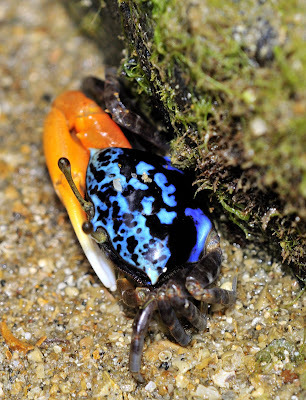 For survival, these two crabs below have found a novel way of hiding from predators. One has decided to cut a piece of sponge and wrapped around its carapace, and the other has chosen to use a dead leaf as a cover. 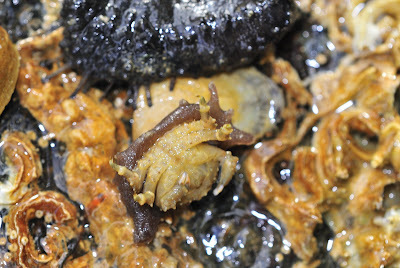 From the top, it looks like any piece of “debris”, but below hide this Sponge Crab. Only when it started to move, that it will give itself away. 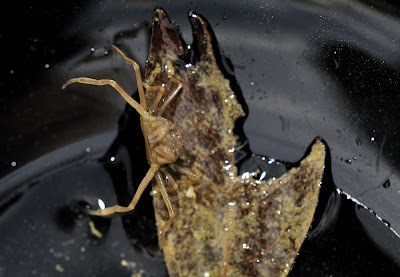 The other master of camouflage, looks for suitable leaf, and with its modified claws (especially the last pair), it will hold onto suitable size leaf. Once again, until it started to move, especially against the flow of water that it will give itself away. 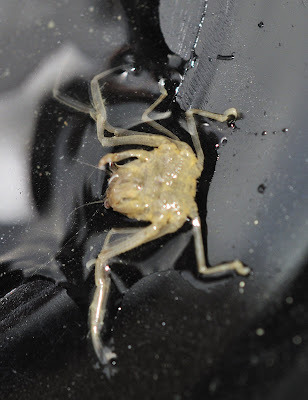 To better understand the Leaf Porter Crab, we decided to give it a different size leaf, and somehow it find our leaf was less than ideal, and will always stick to its own! 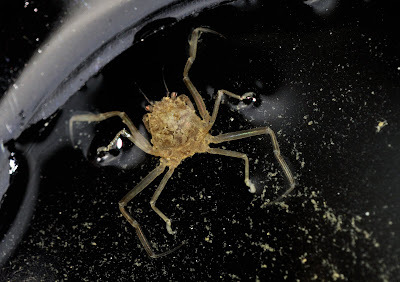 My conclusion is that the size and span of its claws must match the holding areas of the leaf, otherwise it will not be able to use the leaf effectively! 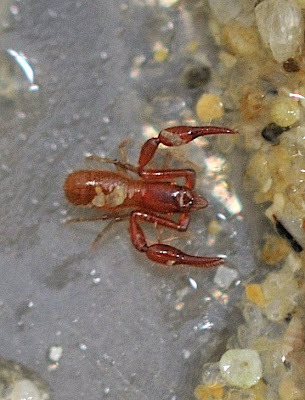 Another specimen that was discovered by Prof Ng, was this Pseudoscorpion (Parahya submersa). It was small, and made me wonder how he managed to find it in the first place. 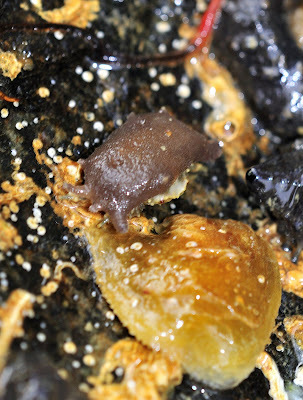 For comparison, look at the grains of sand, in fact our estimation is that its body is only about 3 mm long. 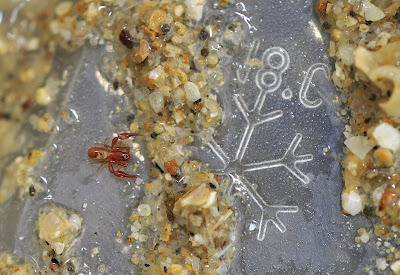 Not much is written about this marine Pseudoscorpion, and literature search on the web did not yield any interesting results!